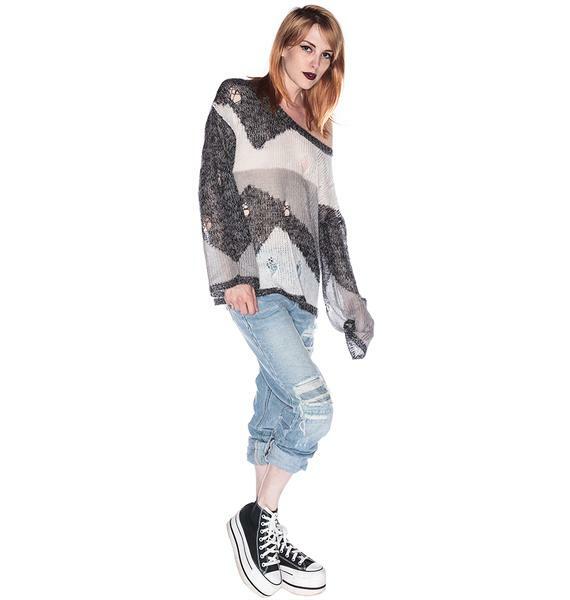 One Teaspoon Watching Me Fall Damaged Jumper is a 90's retro inspired sweater. Lil bit grungy and tons comfy cozy One Teaspoon quality. Geometric shapes all over plus destroyed detailing for that extra I scored this at a vintage store kinda vibe. Holes everywhere. Plus an oversized fit, so this knit will drape on you. You can even wear it off shoulder for a new look. Pair it with frayed shorty shorts and combat boots.